Just Sold! 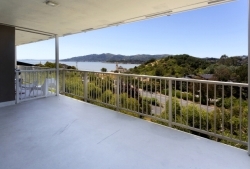 2BD/1BA View Condo in Tiburon – Another Happy Seller Client! Home/General Info, Just Sold/Just Sold! 2BD/1BA View Condo in Tiburon – Another Happy Seller Client! As part of my services, I arranged for crews to paint the interior, clean the carpet, wash the windows, re-grout the bathroom tile and coat the tub & countertop with fresh epoxy. I hired a handyman to repair a few things and I hired a plumber to replace the sink fixture. I also arranged to have the unit professionally cleaned and staged. Once we were all finished, the unit looked amazing! I then hired a professional photographer to take great photos and created a full-color marketing flyer. We sold the property to an all-cash buyer who closed the deal in 7 days, for a little over the asking price.